‘La Chambre Grise’ and ‘La Chambre Noire’ are companion stories that close Fantasmagoriana. Interestingly, these stories do not appear together in Gespensterbuch and not at all in Utterson’s Tales of the Dead. In her advertisement, Utterson notes that she specifically selected stories from Fantasmagoriana that she found to be the most interesting. ‘It [Fantasmagoriana] contains several other stories of a similar cast; but which did not appear equally interesting, and they have therefore been omitted’. (Tales of the Dead, Advertisement, ii). 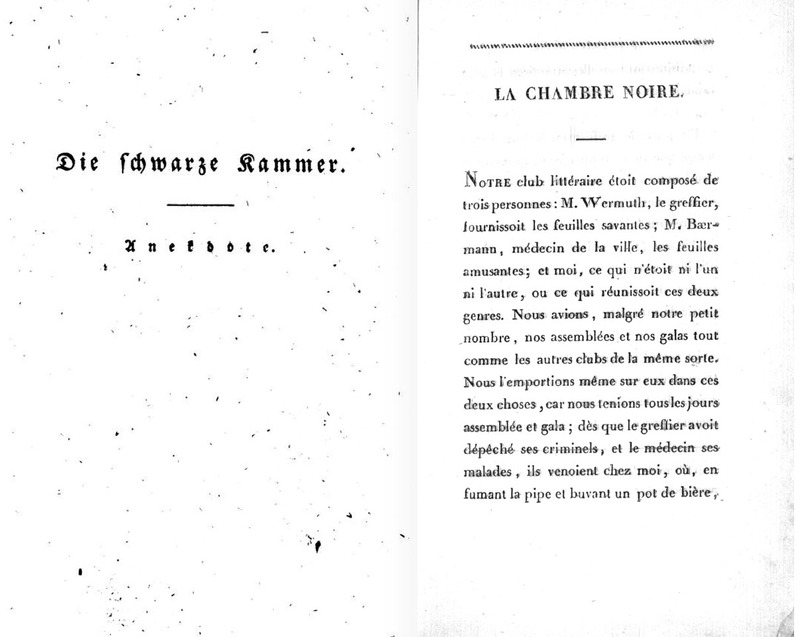 Apparently, ‘La Chambre Grise’ / ‘The Grey Chamber,’ and ‘La Chambre Noire’ / ‘The Black Chamber,’ did not captivate Utterson’s imagination. The stories were only first translated into English in 2004, by A. J. Day. Given the intertextual relationship between these two stories, this blog will be somewhat longer in its discussion than previous entries. This is fitting perhaps, as this entry also concludes our examination of the eight stories in Fantasmagoriana. Let’s start by taking a look at the original sources for these stories. 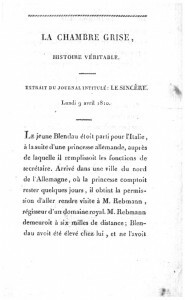 An article in 1914 by Manfred Eimer details us on the Berlin entertainment journal, Der Freimüthige, where the story appeared in issues 71 and 72 on 9 and 10 April, 1810. Originally, the authorship was only initialized as H.C., which has been identified as Heinrich Clauren, a pseudonym of Carl Heun (1771–1854). Clauren was a popular German author in the first decades of the nineteenth century. As we can see, the provenance path of these stories is unique because it is only in Fantasmagoriana that the two stories are brought together as companion stories. The Byron-Shelley circle could not have read these stories together in the original Gespensterbuch or at all in the English translation. So, there must be a surprising element of influence in these stories on Frankenstein, right? Well, let’s take a look at their plots and find out. 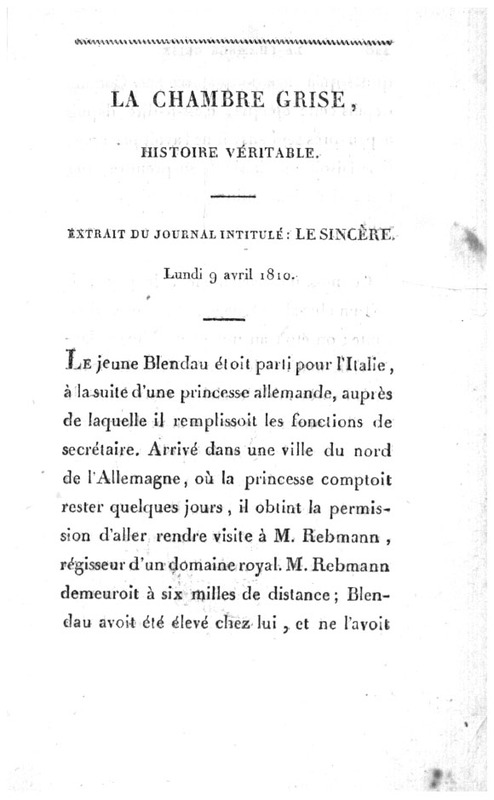 The Secretary Blendau travels with his Sovereign / princess [Fürstin] to Italy. During the trip they stop for a few days in a city near the home of his old guardian, a high-level civil servant [Ober-Amtmann. 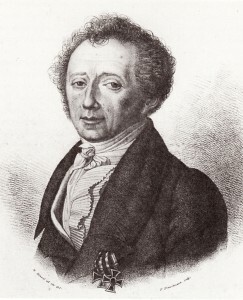 M. Rebmann in French edition]. Taking a few days leave, Blendau travels for a surprise visit. It is winter and he arrives tired and late in the evening, finding only his guardian at home as his wife and children were out nearby. The Amtmann is delighted to see him and the two exchange highlights of their seven years apart. Blendau is tired and wishes to go to bed. The Amtmann tells him to wait for his wife to return and arrange his sleeping quarters. Brigitte the maid mentions that there is a freshly-made bed in the grey room, but the Amtmann dismisses this suggestion. Upon Blendau’s inquiry, the Amtmann asks him if he has forgotten about the Damsel of the Castle [Burgfräulein]. Blendau had long forgotten about it. He is so dead-tired that no ghost can harm him. The Amtmann remarks that he has changed a lot over seven years ago because previously he would not have stayed in the room for any price. Blendau informs his former guardian not to mention his visit to his wife and children so he can surprise them at breakfast in the morning. Brigitte takes Blendau to the grey room, which is described as having the charm of a prison. She quickly departs. Centuries before, the Damsel of the Castle, Gertrude, intended to remain a virgin and take religious vows and enter a nunnery. Despite her cries for help, she is raped in the grey room by Count Hugo the Black. Gertrude tells her confessor and is banished from clerical life and cursed for three hundred years to agonizing torment in purgatory. She takes poison and dies at age nineteen in the grey room. Since then, Gertrude has been seen only in the grey room holding a crucifix in one hand and a dagger in the other with which to kill Count Hugo. The grey room had been uninhabited until the Amtmann took possession of the property and turned it into a guest room—although no visitor has ever slept peacefully in the grey room. Blandau locks the doors, including the door to the corridor leading to the prison tower, and goes to sleep. He wakes at midnight and sees Gertrude holding a steel dagger and crucifix. Gertrude prays softly, raises the dagger to the heavens, and goes to the bed. A drop of ice from her hand lands on Blendau’s face. Blandau screams loudly, jumps out of bed and tries to scream for help from the window, but Gertrude blocks it with her hand so it can’t be opened. She clutches him in her cold arms, he breaks loose; runs to the small door. There stands the skeleton of Count Hugo who has entered through that very door. The Count closes the door, rushes to Blendau, Gertrude falls on the ground, and Blendau jumps into bed under the covers. Motionless, he hears nothing and finally falls asleep. The next morning Blendau first thinks it has all been a dream until he observes that the candlestick has moved and the candles—full the night before—have burned down. The reality dawns on his soul, but he does not dare tell anyone. The Amtmann’s family would undoubtedly torment him to death because they do not actually believe in the existence of the poisoned damsel. Alternatively, if he was able to convince them with serious assurances then the house would be uninhabitable as nobody would want to live with the pale Gertrude and the skeleton of black Hugo. However, if he does not say anything, he would have to spend another night in this torture chamber: the grey room. ‘Blendau, ein gewissenhafter, zuverlässiger junger Mann, verbürgt die Wahrheit jedes Worts in dieser Geschichte mitseiner Ehre, mit seinem Leben.’ (288). 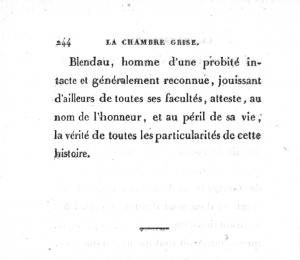 ‘Blendau, homme d’une probité intacte et généralement reconnue, jouissant d’ailleurs de toutes ses facultés, atteste, au nom de l’honneur, et au péril de sa vie, la vérité de toutes le particularités de cette histoire’ (244). ‘Blendau, a conscientious, reliable young man, vouched for the truth of each word in this story with his honour, with his life’ (trans. Der Freimüthige, 288. Fantasmagoriana, 244). So the story ends in the original German and French translation. 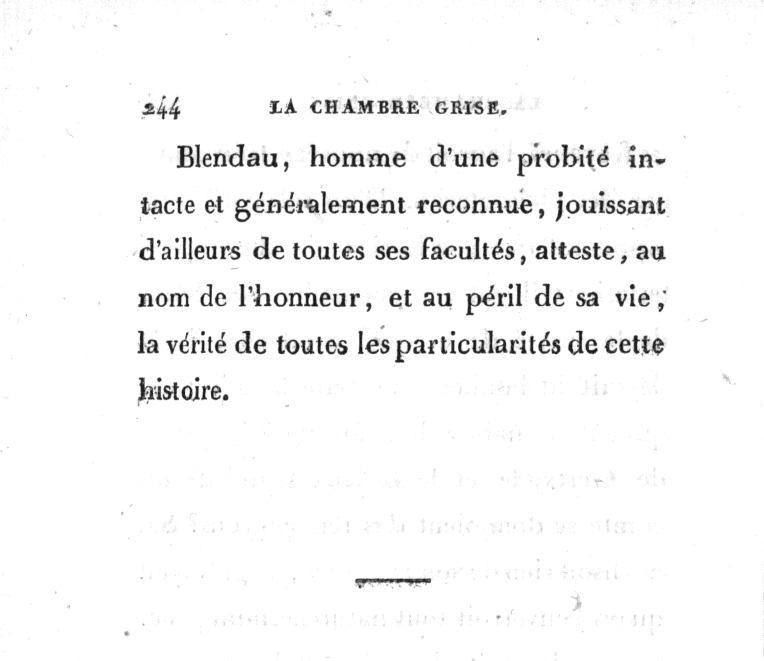 The first English translation of ‘La Chambre Grise’ in A. J. Day’s Fantasmagoriana: Tales of the Dead (2004), however, adds five pages and a whole new ending to the story (see 130-135). The narrative voice switches to first person. Blendau visits the first-person narrator and tells him of his night in the grey room. The narrator knows the Amtmann and decides to investigate for himself. He spends a night in the grey room and confronts the skeleton of Hugo and the spirit of Gertrude. He tells Blendau’s cousins of his experiences and they start laughing. Lottchen, the Amtmann’s daughter, explains that it has all been a trick played on Blendau. They logically explain how they were able to construct their elaborate charade with visible skeletons and cold drops on Blendau’s face. The story concludes with the first-person narrator having Lottchen promise to never play tricks on anyone sleeping in the grey room again. Day was not the first to be inspired to continue the narrative of ‘The Grey Chamber’. Having read the original story in Der Freimüthige, Apel pens a sequel for the second volume of Gespensterbuch which directly cites the events in ‘The Grey Chamber’. The first-person narrator tells us of his journal club, which consists of three members: the actuary Wermuth; the city-physician August Bärmann, and; the narrator himself, a school-manager. Their daily custom is to meet after the completion of their duties at the narrator’s house and read the latest news in several papers. On this particular day Wermuth is late, and Bärmann and the narrator start without him. The narrator starts with Der Freimüthige and a reproach of the story ‘der grauen Stube’ / ‘The Grey Room.’ He reads with secret joy because he already had a dispute with Bärmann about the story, and this reproach would support his position. Questioning the belief in the ‘wandering skeleton’ of the Black Count, and Gertrude’s ability to move candlesticks, as ‘osbcure propaganda,’ the narrator successfully draws out a heated response from the city-physician. Bärmann has had a similar experience as Blendheim [sic: Blendau] in the Grey chamber happen to him, except his room was called the Black chamber. He then begins his narrative. At the completion of his university studies, Bärmann became an assistant to Dr. Wendeborn’s practice. 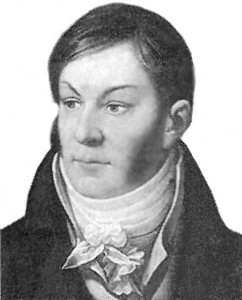 His duties required him to make house visits and he is called to the castle of lieutenant colonel of Silberstein whose daughter is suffering from nervous fever. The parents are anxious for their daughter and entreat him to stay overnight. He is shown to his room which consists of doors, frames, and walls that are painted black. Upon preparing his report, he is interrupted by the Jäger [hunter] who informs him that the room is called the Black Chamber and has a history of being haunted. The Jäger at first offers to stay with Bärmann in the room, and later even offers the physician to lodge with him in his own quarters. Upon Bärmann declining, the Jäger departs. Bärmann makes a thorough inspection of the doors, windows, and even under the bed with his sabre. Nothing. Satisfied he goes to sleep. He is awakened by hearing his name called: ‘August.’ Seeing nothing, but darkness, Bärmann hears a noise. Suddenly, the room is illuminated. He feels a cold hand touching him and a deadly-pale figure is lying next to him in bed. He screams aloud; hears a bang; the room is back in darkness and the figure has disappeared. He makes light and searches the room finding nothing, except for a lock of dark hair on his pillow. Next, Bärmann is called to his patient. The patient has died and her mother, filled with grief, takes a lock of hair as a relic from her departed daughter. It is the same image as that of the lock on Bärmann’s pillow. The next day he falls ill with the same illness as his patient. The narrator finds it a strange story, but remains doubtful. He observes that it suspicious that a ghost can leave physical things behind such as a lock of hair. Their disagreement is interrupted by the entrance of the actuary Wermuth. They inform him that they have been arguing about ‘The Grey Chamber’ story in Der Freimüthige. 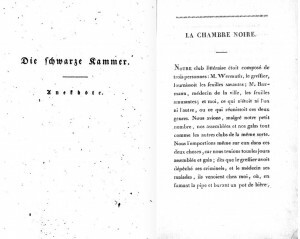 Wermuth says he can provide the counterpart to the story for Der Freimüthige with the title: ‘The Black Chamber.’ Incredulously, they listen to the actuary’s story. Wermuth tells of the lawyer Tippel who recently had an appointment at the Silberstein courts. Due to highwaymen and robbers, Tippel did not want to travel back to the city at night and gratefully accepts the offer to stay in the Black Chamber at Silberstein castle. The next morning he does not appear and the door is forced open. Tippel is found unconscious. Revived, he tells of a terrible night. Hearing a knocking on the door he pressed himself closer to the wall. Next, he hears a rustle and sees a white figure standing in front of a cabinet filled with gold, silver, and jewels. The ghost counts the riches, and then wants to enter Tippel’s bed, who turns to face the wall. He hears a loud cry and loses consciousness. Determined to record his experience and swear to it under oath, Tippel calls for the Justice of the Peace. The Black Chamber is examined, but nothing unusual is found. Upon inspecting the bedwall, the Justice of the Peace activates a switch and the wall slides upwards revealing another, nicer room. Tippel recognizes the cabinet of the ghost, but only a few jewels are found. The chambermaid who occupies the room is called for an explanation, but she and the Jäger, August Leisegang, have disappeared. Clearly, the couple had discovered the sliding wall-panel forgotten since medieval times and used it for their own purposes. In his sleep, Tippel must have activated the lever. Yesterday, the case was brought before the court and the actuary Wermuth had thus been occupied since morning before finally joining his fellow journal enthusiasts. Wermuth concludes by stating that while the Black Chamber is logically explained, the Grey Room story remains a mystery. The party then start their task and read the new edition of Der Freimüthige, which explains a logical solution to the mysteries of the Grey Room. On the surface, both stories seem to have little direct influence on Frankenstein. A closer examination, however, reveals a few contextual similarities that are worth highlighting for Frankensteinphiles. ‘The Grey Chamber,’ with its subtitle ‘A literally true story’ [German: ‘Die graue Stube. (Eine buchstäblich wahre Geschichte)’; French: ‘La Chambre Grise, Histoire Véritable’; English version by Day: ‘The Grey Room, True Story’] foregrounds the ‘real’ existence of the inexplicable supernatural. ‘The Black Chamber. An Anecdote’ [‘Die schwarze Kammer. Anekdote.’] argues against ghosts by providing logical and rational explanations discounting ‘The Grey Chamber’ story. The discussion on the reality of ghosts by the journalism circle in ‘The Black Chamber,’ therefore, mirrors the Byron-Shelley circle’s own ghost discussion upon reading Fantasmagoriana. Byron’s challenge to write their own ghost story, finds its departure perhaps in the closing paragraph to Fantasmagoriana. ‘we are living in a bad time! Everything old goes to ground, not once a honest ghost can keep himself. Do not come to me again with a ghost story. In the current age of ghost-storytelling, logical reality supercedes the inexplicable supernatural. ‘The Black Chamber’ does this by explaining the supernatural logically with the architectural innovations of moving walls. The enduring ghost-story device of Shelley’s Frankenstein is that the supernatural element—that of creating life—is its own logical reality in the Monster’s haunting of Frankenstein. One could read too much into this passage, but I think that it does set a tone for the ghost-storytelling contest that Byron, Polidori and the Shelley’s embarked on! Secondly, the intertextual narrative between ‘The Grey Chamber’ and ‘The Black Chamber’ via a popular newspaper adds a realistic dimension to the discussion of ghosts via the textual medium in which it circulates. Shelley’s use of the epistolary form continues such reality. Naturally, this is a convention beyond Fantasmagoriana, but it is employed in a successful fashion by Eyriès’s placing of the stories to conclude the volume. It may have given Shelley something to think about in regard to the format adding realism to her novel. Lastly, in his afterword essay, ‘Searching for the muse,’ A. J. Day suggests that in ‘The Grey Room [‘The Grey Chamber’] we soon discover themes and ideas that are reflected both in Mary’s debut novel and, perhaps more tellingly, in her own fanciful description of the genesis of her story.’ Day juxtaposes specific passages from the story to descriptions of the Monster/Creature. In her hair she wore the corpse’s wreath of rosemary and sequin-gold. He [Blendau] heard the sequin-gold rustling; he heard the funeral-shrouds’ rustles; he saw his light burning before the mirrors; he saw the shining stare of her eye; her pale lips [….] She lay her hand against the window so that he could not open it and with the other embraced him. He screamed out loud again, because he had felt the coldness of death down his whole spine as she filled her grave-silent arms with him. It was deathly cold. [….] His life seemed to be no longer her goal, but something still more horrifying, his love. The ice-cold phantom embraced him but an almost three hundred year old spirit could not warm him and he froze in her arms. (Day, 129; See: Der Freimüthige, 287; Fantasmagoriana, 239-240). While Day does not explore the implications, it is clear that the similarities between scenes in stories such as ‘The Death-Bride’ and ‘The Grey Chamber’ are creatively amalgamated into new scenes in Frankenstein. Moreover, where Gertrude is a stranger and the horror for Blendau is the obvious repulsion of Gertrude, for Victor, Elizabeth is the lost object of his affection. Her deathly coldness is even more horrific because of the immediate reality of loss. Shelley adds psychological depth and terror through Victor’s feelings of loss and guilt that are absent in the original story. ‘Alle Pulse standen stockstill. Die Schaudervolle bog die Vorhänge des Himmelbettes zurück, ihre […] kaltes Auge schoß einen entseßlichen Blick, als es einen Mann im Bette gewahrte.’ (Der Freimüthige, 287). ‘Blendau est prêt à perdre le sentimenet; Gertrude ouvre les rideaux du lit; l’horreur se peint dans son œil fixe et inanimé, en apercevant un homme dans le lit.’ (Fantasmagoriana, 239). ‘I started from my sleep with horror; a cold dew covered my forehead, my teeth chattered, and every limb became convulsed; when, by the dim and yellow light of the moon, as it forced its way through the window-shutters, I beheld the wretch – the miserable monster whom I had created. He held up the curtain of the bed; and his eyes, if eyes they may be called, were fixed on me.’ (Frankenstein, Volume I, Chapter iv. Macdonald and Scherf, 85-86). ‘ “He sleeps; but he is awakened; he opens his eyes; behold the horrid thing stands at his bedside, opening his curtains, and looking on him with yellow, watery, but speculative eyes.” ’ (Day, 147; Frankenstein, 1831 Preface, xi). Here Shelley’s experiences of horror are exactly like those of the German sleepers, Blandau, Bärrman, and Tippel, who are all likewise awakened in their sleep by a ghost. They too had closed the doors and the shutters, only to be haunted awake by a phantom. Moreover, Shelley’s resolve to write the story because ‘what terrified me will terrify others; and I need only describe the spectre which had haunted my midnight pillow’ (xi) follows ‘The Black Chamber’s’ conclusion to make ghost-storytelling real—in this case, the reality of fright and terror. Certainly, the last two stories of Fantasmagoriana comprised the day’s residue of Shelley’s dreamscape. Her ‘waking dream’ fostering the pivotal scene in her novel of the Monster/Creature standing at the bed is certainly influenced by the night’s reading and discussion. The horrors of Blendau and Bärrman are only comparable to Frankenstein, however, in their descriptive influence of the setting. The complex psychological terror and guilt experienced by Victor far surpasses the one-dimensional flatness of the Fantasmagoriana characters. As such, the Grey and Black chamber stories are prompts sparking Shelley’s imagination to add a psychological depth and reality in amalgamating the room description of these scenes into the creative fruit of an entirely new work. The end of our Fantasmagoriana blog-series? This blog marks an end of our examination of the eight stories in Fantasmagoriana read by the Byron-Shelley circle on that dark and stormy night in 1816. I hope you enjoyed the series. There are still several stories in the German original, as well as Utterson’s English translation, which are worthy of note precisely because these stories were ‘not’ read by the Byron-Shelley circle. So, perhaps more on these in the future. In the meantime, have a wonderful autumn.